Japanese publisher Capcom has taken a lot of flak this year for its policy of hiding "downloadable" content on a fighting game disc, then charging users to unlock it. Sure, they had their business reasons, but when people spend $50-60 on a game, they expect to own everything on that disc. 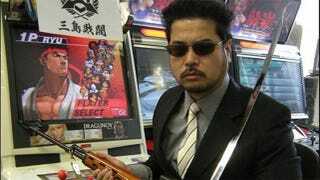 So it's awesome to hear Capcom's someties-partner, most-times rival in the fighting game scene, Tekken boss Katsuhiro Harada (pictured, badass), speak out against such policies. "Actually this is something my bosses have been asking me for quite a while now - what are our plans for DLC? ", he told Eurogamer. "How much money can we make? They are a company, obviously, in it to make money. So it's something I'm continually asked even now. But I haven't changed my stance. If you're making a fighting game, all of the elements necessary to enjoy it should be on the disc, or should at least be available for free." Later, he draws an even bolder line in the sand, saying "If I was given the choice to include paid DLC or quit Namco, I would maybe quit... Or maybe I would just say 'get someone else to deal with this'." Well said, Mr. Harada. Well said.